While driving a car may still be a long 12 months away, life on two-wheels can start at 16, which is why we’ve cobbled together this step-by-step list on how to get on the road at 16. You are able to apply three months prior to your 16th Birthday for a provisional drivers license. This is a legal documentation and is required to be able to ride a moped or motorcycle. It’s also a useful form of ID and cheaper to replace than a passport! You will also need a colour passport-style photograph of yourself. Once you have received your provisional drivers license you can now complete the Compulsory Basic Training (CBT). At the age of 16 you are able to ride a moped with an engine size of 50cc or less and a top speed of 45km/h or less, but first you need to complete your CBT. There are hundreds of test centres across the UK however test prices vary in cost depending on your location – the average price usually ranges from £120 – £150. Compulsory Basic Training is not a test- it is basic training, which will help you become a safe and confident road user. This course is a legal requirement for any learner riders and the aim is to reduce accidents among inexperienced motorcyclists. Once you have completed the course you will receive a certificate (DL196) and this is valid for two years only. After the two-year period you will have to take the CBT course again. You don’t need your own bike to take the CBT as you can hire one off the test centre, as well as any equipment, for no extra charge. You can choose to use your own motorbike but it needs to have a valid MOT, Road Tax and Insurance. The course takes eight hours to complete and this is usually done over one full day. You will usually be in a group of four with one instructor throughout the day. – Here, your instructor will talk to you about the correct clothing and equipment required to ride a motorcycle. – The Eyesight test simply asks you to read a number plate from a 20-metre distance. – This section will explain how to use the controls of a motorbike such as brakes, horn, indicator lights, gears. – Your instructor will take you through how to balance on a motorcycle, moving off, slow riding, stopping and other aspects. – In this section, your instructor will take you through your positioning on the road and how to approach roundabouts and other dangers. – You will also learn how to do basic checks on your motorbike & simple maintenance tasks. – This is the last stage of the course; here you will spend two hours riding on the road with an instructor. You will put into practice everything you have learnt throughout the day. What is the hazard perception test? 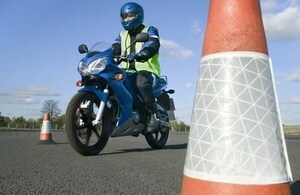 The hazard perception test will only be covered briefly during the CBT course. You will look at different situations and learn what a hazard on the road is and how to avoid any danger. When riding a motorbike on a road and a cyclist is in close proximity to you, this is a hazard. You would then be asked how to avoid any danger. The answer you would give is: “I would slow down to a speed below the limit. I would then check my mirrors and move to a safe distance between the cyclist and myself. I would then keep on my brakes in case the cyclist doesn’t see me. Once you have completed your compulsory basic training and hold a valid CBT certificate, you can now ride a moped with L-plates until the CBT certificate expires. The Moped must not have an engine bigger then 125cc and Learner Plates must be attached to both the front and rear of the moped at all times. The Compulsory Basic Training Plus course is optional; it takes an extra three hours and covers in more depth how to handle the bike and hazard perception. Rather then being in a group of four people, this course will be on a one to one basis. People that usually complete the CBT+ course are not used to riding at night, feel intimidated by busy traffic or are concerned about riding in poor weather. This course is usually an extra £75, but most test centres off it.